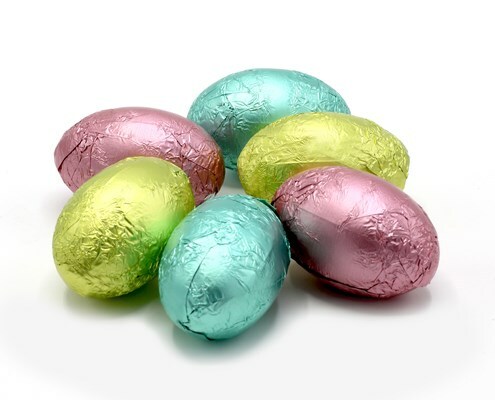 These Easter eggs are sold in simple bags or bulk cases for use in Easter eggs hunts, with an option to choose gift packaging with ribbon and Happy Easter tag for individual token Easter gifts. Easter eggs measure 3.5cm. Colours can vary from the image shown. Milk chocolate cocoa solids 30% min. milk solids 18% min. Sugar, whole milk powder, cocoa butter, cocoa mass, lactose (milk), emulsifier: soya lecithins, natural flavour. May contain traces of nuts & gluten. Nutritional information per 100g: Energy 2249kj / 539kcal, Fat 31g of which saturates 19g, Carbohydrate 57g of which sugars 56g, Protein 6.4g, Salt 0.20g.